1. Understand the grids of an EKG paper printout. Voltage—the electrical signals of the heart—is measured along the vertical axis; time is measured along the horizontal axis in squares. There are large squares that are divided into smaller squares. - Small squares are 1 mm across and represent 0.04 seconds. The large squares measure 5 mm across and represent 0.2 seconds. - 10 mm in height is equal to 1mV in voltage. - Interpreting these values will help you determine if the heartbeat is irregular, or too fast or too slow. 2. Find the QRS complex and label it on the handout. The Q wave is the downward or negative dip right before the large spike. The R wave is right after that, and is usually the largest spike on the readout. Following that is the S wave, which is the dip down below the baseline again.Label all of these parts on the printout. - Look at the peaks on the printout. You will need to look at the whole strip to check for an irregular heartbeat. - This is a pattern called normal sinus rhythm, and it's the basic EKG of a healthy heart. Many people's EKG may vary slightly from this baseline, though, while still being completely healthy. 3. Assess your P-waves. Find the P-waves on your EKG. P-waves are the smaller spikes right before the larger spike (the R wave). They should be at the approximately same duration, direction, and shape through the entire EKG. - If they are not present, see if there any movement to the line at all, like a flutter, sawtooth lines, or a flat line. - P-might just be a small rise, or bump, on the graph. They will not be as sharp or as high as the QRS complex. 1. Measure the time between your heartbeats. 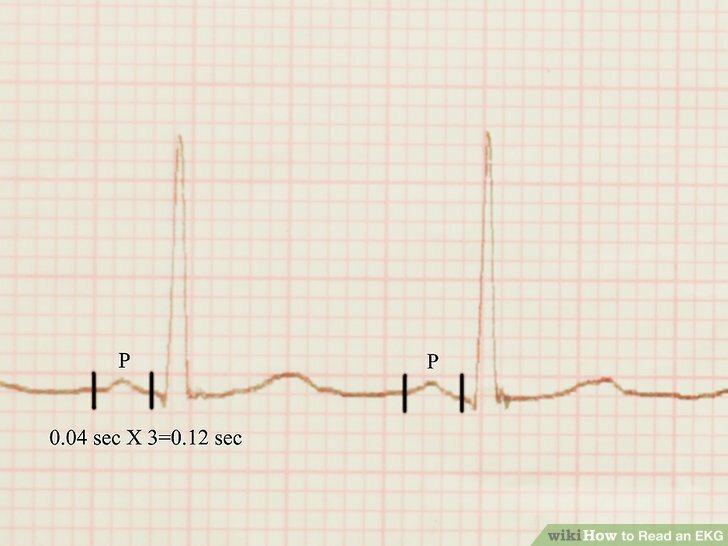 Locate the beginning of the P wave and the beginning of the QRS complex. This is called the PR interval. Normal duration is between 0.12 to 0.20 seconds, which is three to five small horizontal boxes. - This amount of time should be pretty consistent across the entire strip. 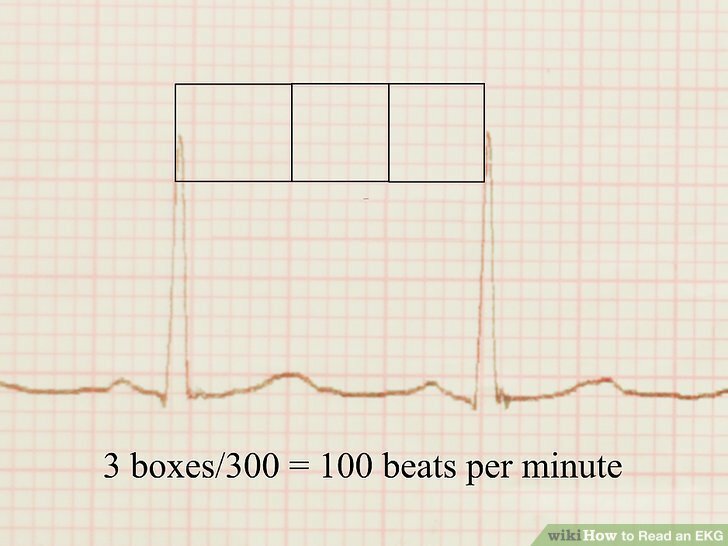 If there is a varied amount of time (boxes) between beats, it can indicate an irregular heartbeat. This is only something to worry about if your doctor says so. It can be completely harmless. 2. Assess your heart rhythm. You may have a regular or irregular heart rhythm. If your rhythm is irregular, it may be regularly or irregularly. To determine the rhythm, check if the intervals are the same length. Mark a few of your R-R intervals on a separate sheet of paper. Use that sheet of paper to move along the rhythm strip to see if the intervals are all the same lengths. - A regularly irregular rhythm has a pattern to the irregular rhythm. An irregularly irregular rhythm has no pattern at all and is all over the place. 3. Calculate your heart rate if the heart rate is regular. You can use the following formula to calculate your heart rate. Count the number of squares between the two peaks (the R waves). Take 300 and divide it by the number of boxes between the 2 peaks. In this diagram, it's 3 boxes, so 300 divided by 3 = 100 BPM. - If you counted 4 big boxes between peaks, you have a heart rate of 75 beats per minute (300/4) = 75. - This is only used for regular heart beats. 4. Calculate your heart rate if the heart rate is irregular. If the peaks aren’t regular and there are different amounts of boxes between them, the heartbeat is irregular. Count the number of spikes that are in a 6-second readout and multiply the number by 10 to get an approximate rate. For example, if there are 7 R waves in a 6 second strip, the heart rate is 70 (7x10=70). - Alternately, you can count the complexes on the rhythm strip, which represents 10 seconds. Multiply that number by 6 to find the 60 second heart rate. 5. Ask your doctor about any irregularities. Though everyone’s normal EKG readout can vary, there are some irregularities that your doctor may investigate further. Your doctor will look at your EKG results, combined with your symptoms, and start to form a diagnosis. - If the interval between the P and the R is too long, this is called a first degree block. A bundle branch block is when the QRS interval takes longer than 0.12 seconds. Atrial fibrillation is present when an irregular heartbeat occurs when the P waves are non-existent and replaced by a squiggly line. - Keep in mind that some irregularities may show up on the EKG, but they may be considered normal if you do not have any symptoms, such as dizziness or lightheadedness. 6. Avoid diagnosing yourself. Reading an EKG accurately takes a lot of knowledge and practice. While you can learn how to read your EKG and notice any irregularities, you should never try to diagnose yourself based on the EKG. Instead, you should let your doctor or medical professional diagnose you. - Even if you think your EKG is showing irregularities, this does not necessarily mean something is wrong. Everyone has their own unique heart signature. - If you are worried about something on your readout, talk to your doctor and get them to explain it to you.